Email marketing is not spam, even though most companies that use this tool simply send irrelevant information to attract users. When you add an email capturing facility to your website, you can help your growing business to be even more precise when targeting an audience. To be done right, email marketing has to be built – database to be created, which proves you of your clients and who are they. This is something that you need to be thinking about – their age, their location, how much they earn and then offer the right product to suit their potential needs by creating the right email marketing campaign. This can happen when you have a high quality content that will represent your brand in the best way possible. 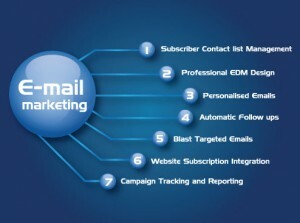 This is the best way that you can get in touch with your previous customers – email marketing campaigns specialise in sending the newest offers, news about your company, promotions and sales on products to remind them that you’re still out there and you intend on growing and offering more to the looking eye. We can make sure to tailor your content as being entertaining and non-obligatory, informative and at its core effective, so you can raise your conversions to the roof. Syncing everything else won’t be hard since we are the professionals that deal with your social media performance and online marketing. Found Online’s team of professionals are people who strive to help others overcome the power of the online world and make sure that you use every bit of it’s tools and tricks for your benefits. We also profile your clients and base the campaign on proven facts, since we strive to understand everything there is about them as their lifestyle, their desires and what they buy – and we send the right products to the right client. All you need to do is talk with us and together we can estimate the best strategy for your business and we will start working for a successful future together!